Consider the rare culinary treats that come the way of a professional mouth. Ortolan. Foie gras-stuffed gooseneck. Scrambled eggs with pungent white truffle. In my long life of eat and tell, there was the first sea urchin, the shock of a barely cooked langoustine by Fr�dy Girardet, the first bollito misto orchestrated by the seductive young Sirio. That doesn't explain my weakness for chicken, or is it a passion? At dinner if none of my guests order it, I usually do, and even though I tend to loathe the white meat, I will always take whatever part is leftover home for lunch if no one else makes an aggressive move. I do love chicken. These are my favorite birds, right now, not exactly in pecking order, given the collision of candidates at the top. I'll be sitting here all afternoon if I don't just begin. 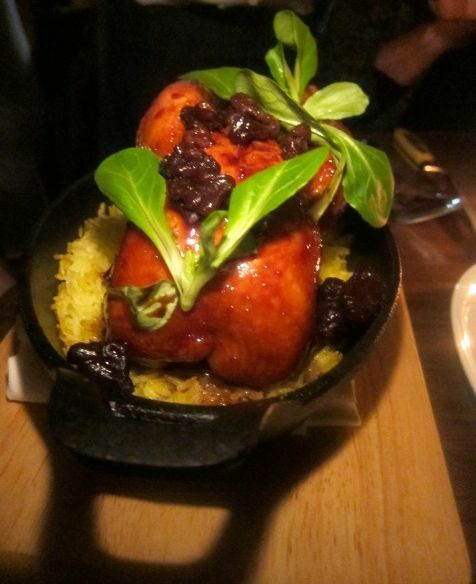 Bar Bolonat I think about it a lot, lacquered to a crackle, nested in crisped rice and potatoes in a black iron pan and accessorized with pomegranate caramelized walnuts on top. A few sprigs of green complete the Technicolor effect. The second time there was a tad less socarrat to scrape up. Never mind, if anyone at my table hesitates, I'll swoop in and finish it off. Just last week, this small $32 budgie was almost enough for three of us alongside a plate of peppery hot ,hand-cut pasta with garlic, fresh breadcrumbs and yogurt. Of course, that was after a parade of the house's best starters: fried cauliflower with peanut tahini crunch, the fatush salad and the eggplant with sheep's milk yogurt. This spot is small and crowded, the bar packed, not with fashionistas or the beautiful strivers, but with real people of all ages who seem to be drawn by the $13 cocktails and the chef's riffs on Israeli cooking. 611 Hudson Street on the NW corner of West 12th Street. 212 390 1545. Dinner Monday to Thursday 5:30 pm to 10:30. Friday and Saturday till 11 pm. Closed Sunday. For 28 years, La Mangeoire did well enough playing a Proven�al game. Now with the master Christian Delouvrier running the kitchen, the house has redefined itself as French Country. His masterly cassoulet of Castelnaudary -- with lamb and pork, pork sausage and tarbais beans -- made the fearsome winter more bearable. But it's the chef's whole, plump roasted bird, carved in the dining room, rich and succulent, that I celebrate. It used to be served oozing juice onto fat French fries below, with a salad of butter lettuce on top, touched with a mustardy vinaigrette. I loved it that way, but apparently timid regulars found that confusing. So now the fries come alongside, salty and crisper. The salad can be delivered before, with or after. 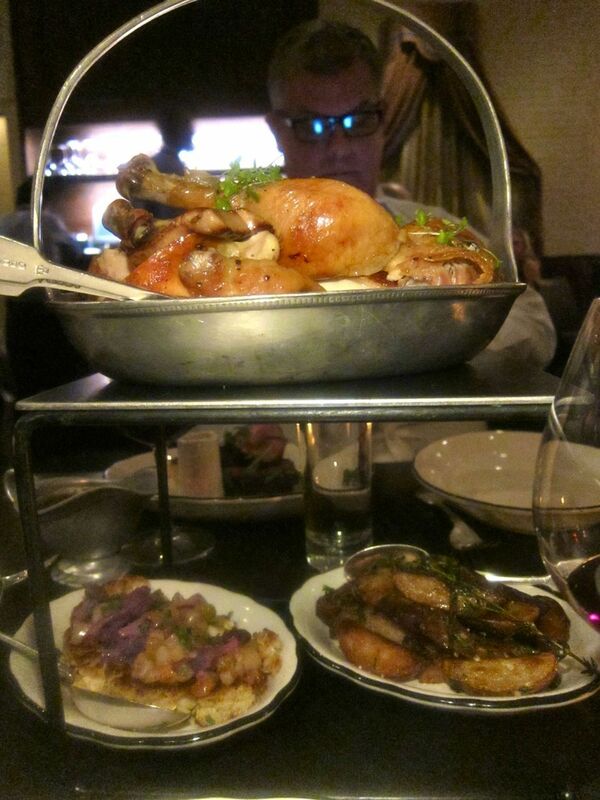 It might be best to order in advance, certainly as soon as you arrive -- it takes a while to roast the whole bird. Sure, you can order a half, too. 1008 Second Avenue between 53rd and 54th Streets. 212 759 7086. Monday to Thursday noon to 10 pm. Friday till 10:30. Saturday 5:30 to 10:30. Sunday 11 am to 4 and 5:30 to 9 pm. I quickly developed a crush on The Writing Room once I realized it wasn't really about Elaine Kaufman, but was more about the rotisserie chicken with roasted vegetables. Not everything on the menu of pop favorites is equally winning. But I'm back again and again, trying to persuade my friends to join me in a whole bird, hoping they will favor the breast meat so I can dominate the dark. This is no shy poussin. It's a well-raised grown-up, easily big enough for four. I also recommend the fried chicken with an old-fashioned biscuit, but not the too-vinegary coleslaw. It would be derelict not to note that my favorite dessert is the trio of chocolate-covered creamsicles escorted by a melting brownie. They know me now, and I am rewarded with a table in the quieter library. Friends who recently sat upfront were so spooked by the revved-up din that they left half way through dinner. They got an email offering a refund, urging them to return. I'm assured sound proofing panels and padding are in the works. 1705 Second Avenue between 88th and 89th Street. 212 335 0075 Dinner Sunday through Thursday 5:30 to 11 pm., Friday and Saturday till midnight. Brunch Saturday and Sunday 11 to 3:30. My favorite warm ups include smoked salmon-eggplant bruschetta, the shrimp and snow pea dumpling, little vegetable-peanut bundles, five-flavor chicken, and the Shanghai pork-and-crab soupy buns. You may feel the intensity of the dozens queued up for tables here. I order the fruit plate anyway and linger over mango, pineapple, melon and berries. 2170 Broadway between 76th and 77th Strrets. 724 9700. Monday through Thursday lunch 10 am to 3 pm, Dinner 4:45 to 11 pm. Friday and Saturday to 11: 45 pm. Saturday and Sunday brunch 11 to 3 pm. Sunday dinner till 10:30 pm. After some years of wandering, Jonathan Waxman has settled at Barbuto in front of the big brick oven where he channels his affection for Italian simplicity. His fans crowd this abandoned Village garage with its concrete floors and walls that roll up, weather permitting. Start, as I do, with a salad, or share a pasta. 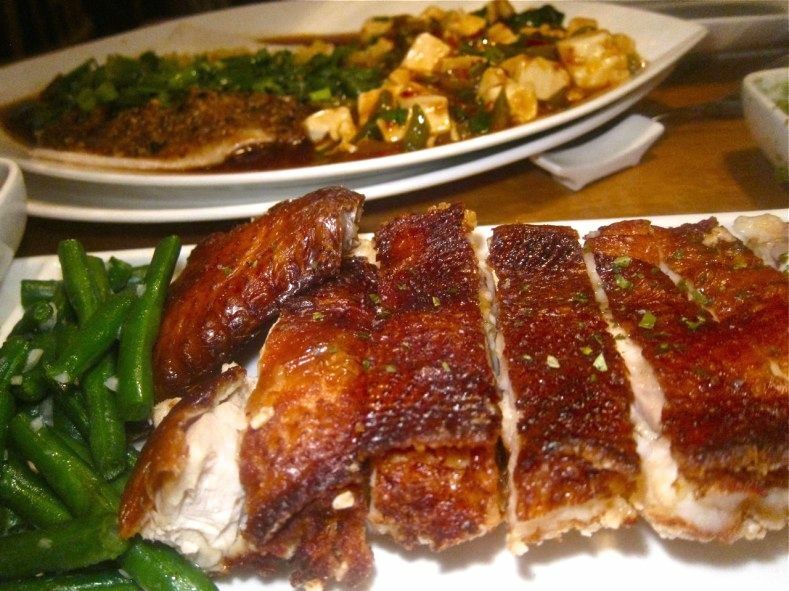 Then attack the chef's crisp-crusted signature bird, still just $19. There's nothing more on the plate than his lemony salsa verde: rough chopped parsley, basil, arugula and mint with a hit of garlic and bits of hot pepper in an olive oil emulsion. The chicken is pretty much the same when he's not there, but watching him move lazily in front of the fire adds to the gravitas of this iconic plate. I like the period French look at Rotisserie Georgette -- the Portuguese tiles framing the mostly-open kitchen, the dark wood armoire, the palatial drapes, the flea market tapestry and the eccentric collection of mirrors. 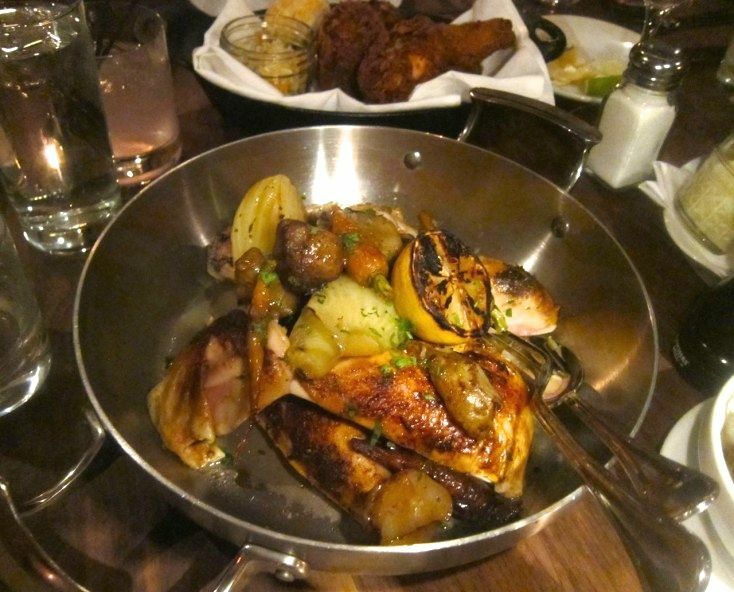 And though it took a while for the kitchen to hit its stride, three of us recently savored her $72 Poule de Luxe for two with potatoes soaked in its drippings. I could live without the seared foie gras nuggets (that's the "luxe") and I wouldn't mind more wild mushroom stuffing, but the bird is really juicy now, full of flavor, seasoning revved-up -- even the white meat is wonderfully moist. Ordering tarte tatin for the table brought Georgette herself with a crock of cr�me fra�che. 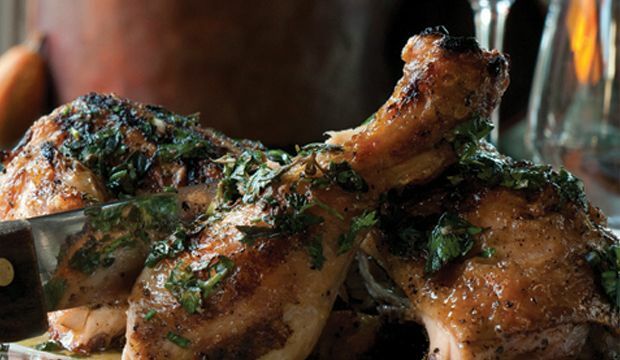 Please click here to read about Charles Gabriel's masterly chicken and where to buy it, and to pick up leads to my other favorites -- Benoit's classic served in a skillet, Hill Country's pies and thighs and Mountain Bird's delicious obsession with winged critters. In their wildest dreams I can't imagine Noah Bernamoff from Mile End and Matt Kleigman of The Smile saw the fiercely maniacal and mounting demand last week that forced them to close their new shop at 170 Elizabeth Street (between Spring and Kenmare) Monday for 24 hours. 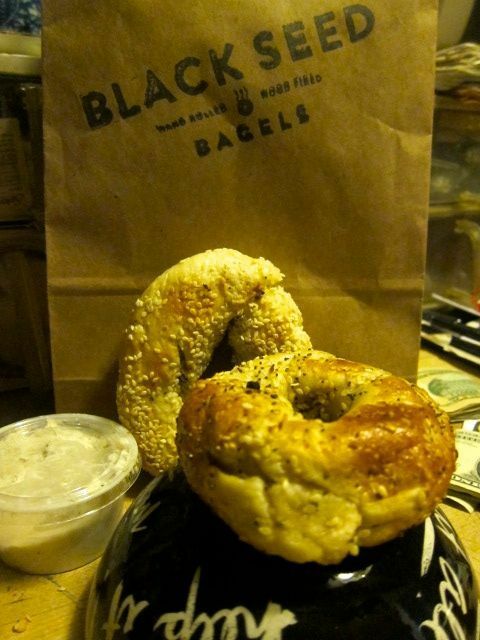 As the first dented, hand-rolled, fermented bagels tumbled out of the wood-burning oven after a boiling in honey-touched water, on Wednesday, Bernamoff described the philosophy: "The bagel's shape is original, the size is reasonable and the seeding is substantial." The shop also makes its own cream cheese and uses it to mix smoked fish and vegetables spreads. I persuaded the press agent to send me a sample. It arrived after I'd already left the office. On Thursday I took a bite of the ever-so-slightly stale round. And loved it. Toasted, it was thrilling last night piled with creamy goat cheese on one half and tuna salad on the other. I wouldn't mind if they were smaller but they do put the mini bagels I've been eating to shame. Black Seed has signed up to put a floating kiosk in Hudson Eats, the dining terrace at Brookfield Place opening May 6th. They'll be selling sandwiches, salads and beverages there too just as they do on Elizabeth Street. I can only hope they'll plant a seed in my neighborhood soon. These are cherry blossom colors today. 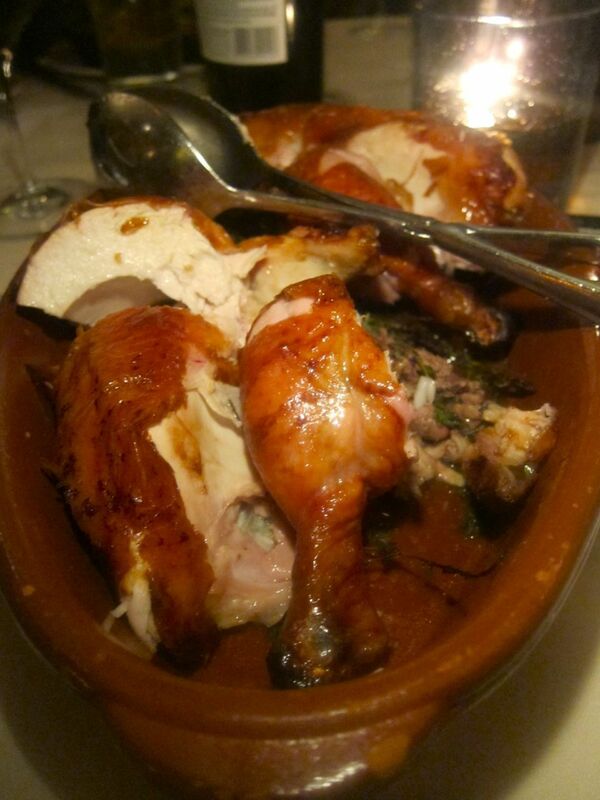 Photographs of Bar Bolonat's lacquered poussin, La Mangeoire's masterly bird, The Writing Room's rotisserie chicken, Red Farm's shrimp-stuffed, crispy banquet bird, Barbuto's chicken with salsa verde, the top bird at Rotisserie Georgette, and my Black Seed bagel before I devoured them may not be used without permission from Gael Greene. Copyright 2014. All rights reserved.